It’s never dull being the Manager of a creative health charity….yawn! Another week has gone by with it’s usual collection of mini crisis, visitors and reward. All of this can be very draining for those few who take overall responsibility for the smooth running and working of a small charity like ours. At times we are very close to breaking point, pushing the boundaries of what we can achieve with limited resources. Success comes through not letting those who need what you offer know just how hard it is. This is especially true as we approach an exhibition. In the last week and a half I have mounted, framed and hung over forty pictures alongside the admin, running sessions and being there to listen to people. I have had five visitors looking to develop links, hire rooms or use our services. In the absence of more volunteers who have those skills we need, it seems to fall to a few to plug the gap every time. Again this week I have been hearing what a wonderful and creative place Kendal is to live. My fear is that many people do not appreciate the hard work and hours that go into delivering all that. Right from the big arts organisations, down through the festivals, artist groups, individual artists and charities. It takes funding, time and volunteers. Few people realise how precarious many of those creative charities are, surviving week to week to provide a high quality and valuable service to the vulnerable. As we head into our two week summer break at Space2Create thoughts turn to relaxing, lounging around a bit. Maybe a spot of painting for pleasure…….or is that all just some kind of dream? The 2Create group started a small project using a range of media today. The group looked at an artwork by Picasso and divided it into twelve squares. Each person took one of the sections. Everyone chose to do their section in a range of media so that when we join them up they form a mixed media large representation of the work. The Unity Group had a look at the work for their part of the exhibition that opens on Saturday. Then we did some mixed media pieces about the benefits of being creative. First putting down a background layer, then selecting words and images to add. Finally we added extras and painted or drew lines to bring it all together. Julie and Clare attended an event at the Lakes Foyer for Impact Housing residents. It was a chance to chat to people about what we did and our sessions. Clare led the session and along with the usual free writing, writing ideas and warm ups the group had a go writing about something they are not. With Gene Kelly or Ginger Rogers. If spiders wore flippers on each of their 8! For their ballroom appointment with Gene or Astaire. If a juicy young fly might swing by for tea. We went ‘small’ this session, making tiny cards and books which are hidden within a card sleeve. We folded and glued the card to create the sleeve envelope. Using mixed media to decorate it enabled everyone to produce something unique to them. The cards within were also made personal and appropriate to each individual. The DeafArt group has been quietly working in the background and forgetting to send us photos! They remembered this week which is a good reminder as the session leader Ant has his exhibition opening at Unit 31 tomorrow. The group have been experimenting using forks to create images which creates an interesting texture. The group carried on with the group project from Tuesday where we had split a picasso painting into squares to do individually and larger in mixed media. Just two pieces missing now while we wait for them to dry! Ant was working on his own piece inspired by an image of a stone angel. One of the great things about running Spac2Create are those moments when you actually do something that makes a big difference to somebodies life. It may be a really small thing that makes them smile or it can be quite a big thing that feels like it has the potential to start something. Our next exhibition includes a solo exhibition in the main gallery at Unit 31 by Antony Dixon. Antony is profoundly Deaf and struggles with his confidence and getting involved in the world. feeling very excluded. We have given him the opportunity to show the talent he has as an artist that means many people will become aware of his work that would never otherwise see it. Hopefully this will encourage and act as a springboard to move forward for Antony. Next weekend is the opening of Antony’s exhibition “Silent Visions” (Saturday 1st August 2-4pm with Cake!). Alongside Antony in the side gallery of Unit 31 will be an exhibition by the Unity Art Group. This is from a 12 week block of work SPace2Create ran for Unity service users just as a taster to various art and craft activities. In the end they produced a fantastic range of work. All that Space2Create does depends on grants and donations at the moment. We are looking at ways to make us more secure and earn an income alongside the grants to make us less dependant and more self sufficient. It is really hard to do this. There are three main ingredients to what we do at S2C. People, money, art! People who volunteer, are helped by us and support us. Money that pays for it all and art that enriches, motivates, ties, has purpose and inspires. Enjoyable session as it was very relaxed. After a few sessions playing around with acrylics the group went in different directions today to create some interesting work. Clare was working on her murmerations picture using a variety of media. In the background others were working on getting ready for our next gallery exhibition which opens on the 1st August. The group made small folding books. These are made using three squres of card, folded and glued with two small ccard covers. They close up into a small book but open out to give a large area to work on or put images. The group filled their books with motivational words and pictures. Managed not to have any pictures but in the end this was an unusual group session. We have had a large fabric donation so the group had it spread out all over the place deciding what would be useful to us. Some we gave to nearby Manna House, some we are going to sell on as a fundraiser and some will be used in our own projects to make up into items to sell at fairs and shows. The group was inspired by the books we made with Unity earlier in the week. We decided to upsize them and started to make giant folding books which we began to fill with zentangles. We were hoping the end result would be a book that could be hung up and display the zentangle in random facets wth the way the book folded. Yellow Wallpaper- a model for successful collaboration and other stuff! The Yellow Wallpaper Project was completed this week with the exhibition opened on Tuesday at Blackwell (More later!). This project was an almost perfect collaboration between two organisation for the benefit of all involved. Lakeland Arts set a very high standard in their Galleries and also have some wonderful practitioners working with them to engage with local communities. As a large organisation in the local area their resources far outweigh those of S2c. It was brilliant that they asked us to be involved. 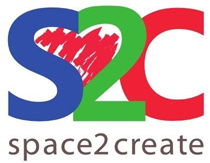 The benefits for S2c have been a wider awareness of the services we offer and the work we do as well as acceptance through association with Lakeland Arts in terms of the quality of work we produce. The benefits for the service users who participated was a massive boost to their self esteem, being able to experience and cope with a very different location and environment as well as dealing with emotional issues raised in the project. They also learnt new skills and had their work exhibited at a prestigious local attraction in Blackwell Arts And Crafts House. For Lakeland Arts is raised their profile, generated awareness of Blackwell to an audience they might not usually engage with and, I am sure, ticked lots of boxes in terms of their overall aims. Not forgetting the wonderful artist Emilie Taylor who led the project who’s work and skills as both an artist and arts for health practitioner enabled the group to produce the wonderful work they did. Heres to the next collaboration. A quiet session in terms of people joining in today as everyone was getting ready to go to Blackwell for the exhibition opening in the afternoon. The group looked at the work of artist Leonid Afremov who uses a pointilism style combined with more normal painting techniques to produce stunning impressionistic painting. Using bold dabs or slashes of colour the participants created their own images to great effect. Things that go on at Space2Create often leave me proud at the achievements possible by people who are ill. Today was one of those occasions when I was particularly proud of the participants from S2C of The Yellow Wallpaper Project. The opening today was brilliant with loads of people there to see the artworks in location in the rooms at Blackwell. They looked amazing and fitted in perfectly. These are just a few quick snaps. I will do a more detailed blog post on our website. Many many thanks to the artist Emilie Taylor, Shannon from Lakeland Arts and every single one of the participants. A session inspired by a variety of word games which we then used to create writing. This poem was created by making words from the phrase “The break of day” and then using those words in the poem. The breaking of returned terror. The session was all about textiles and fabrics. Members of the group were undertaking different projects including making purses, owl doorstops, fabric coasters and crochet items. A creative and productive session. definitely feeling like the summer holidays today! The group carried on looking at using dabs to create painted images and today tried to be more abstract or impressionist in style. Some ended up looking like a photography technique called bokeh which uses lights and blurred images. After this we had a bit of fun with our palettes by smearing them onto paper to create more abstract images. manipulating the direction as they smeared produced some interesting images as did layering one on another. The Transformations project is underway and many of the artists are now working on their pieces from the poems or writing from our creative writing group. We hope to showcase different artists over the weeks. I’m a painter with three different areas to my studio practice: an on-going experimental/experiential/developmental work that is very much a doing process; a considered thought out process that is mainly figurative/conceptual; working to commission. Admin versus creativity, Yellow Wallpaper and volunteer (PLEASE!). The Yellow Wallpaper Project in collaboration with Lakeland Arts and Emilie Taylor reaches its conclusion in the next week with the opening of the exhibition of work at Blackwell. The exhibition opening at Blackwell starts at 2-30 until 4-30. All connected with Space2Create are welcome. The ceramics deal with individuals inspiration from a short story called “The Yellow Wallpaper”. The women only group have expressed issues in their own lives through the creations which will be displayed at Blackwell until September. We are always looking for volunteers. At the moment we want people who can: Clean!, Update and monitor social media, lead creative sessions, work on comic art projects for October, promote and advertise S2C, man the gallery and maybe start opening at weekends, be key holders, take creative writing sessions, take photography sessions, organise volunteer forms and monitoring, develop and monitor service user tracking, conduct organisation level evaluations. Not much then! If you are interested get in touch! Mat continued the theme of watercolour scenes drawn in pen. Those who had started some carried on and new people started images too. Most variations on the theme of harbours and seaside. Some did cartoon and grahic illustrations. There was also some sewing and needlework going on too. The group were looking at printing. Having had a session on mono printing we looked at using blocks we created out of tiles. These soft tiles can be marked with biro. The difficult concept was understanding the block represented a negative image of the print and of course care had to be taken to get writing the right way round. We made blocks and printed individual designs and then produced a group design. Go after it with a club. A group from Manna House called round to the Unit for a session. Julie and Jane took the lead and had a go at block printing with them. Pressing into polystyrene tiles to make printing blocks, they did individual and a group print. This Thursday session was a usual mix of activities and work being created. One volunteer brought in fabric samples, so ideas were formed as to how best to use them. Purses, bags coasters, pencil cases and pictures were suggested and some were even started today! Others in the group worked on hand-cut butterfly pictures, machine embroidery and printing. A very varied, busy session. On the ward, we worked on miniature seascapes using watercolour and pen and ink. The small size made the activity not only appealing, but also achievable within the time constraints. It was great that one participant was experienced in watercolour painting and could give everyone helpful tips and techniques. The WellArt group carried on with the theme of creating pen and watercolour scenes with some finishing work and others starting new ideas. Some did flowers and others more general scenes. A very relaxing and enjoyable session. Good vibrations, the cost of caring and the motions of the planets! One of the reasons I voluntarily run Space2Create (I am a closet dictator although benign!) is the payback from people. I try to help people out, inspire them, give them opportunities, move them on, boost them up and be there when its bad. It is very draining and at times pushes me to the limit of what my own frail health can endure. Never letting your own weakness and insecurities be exposed to those who rely on you is hard. When I talk about payback its the comment from a person I respect saying how wonderful Space2Create is. It is the flower given to me by a service users who says thank you. It is the artist who emails you to thank you for the opportunity to be part of a project. It is service user who is too ill to come in who rings you up to say their sorry and how much they will miss coming but that they know everyone is thinking of them. It is two people you have never met who turn up to look round because somebody in another part of the country has been raving about your organisation. It is the service users who arrives scowling and leaves smiling. It is the person who says they feel safe for the first time in years. It is the person who gets a job and thanks you for references and the chance to volunteer. It is….well all of those and more. The other part of being in charge is making sure it is all funded. As we are all volunteers we have no staff costs but there is all the stuff to pay for, resources, rent, running costs. We rely on grants though we also are generating income from hiring our space and hiring out our services. It is a constant treadmill, jumping through hoops to meet the requirements of funding. It is surprisingly easy to get money for the things you do with an end product. The problem is many funders need to see an end result so things like rent and electricity bills are harder to find money for. The irony is that without those all the other stuff doesn’t happen. As summer breaks out for a bit our sessions this week have been quite. Is it the weather? You sit down and start counting on your fingers. Well so and so has an appointment, is ill, is on holiday, is looking after a relative, caring for a child, is in hospital, is struggling with a change in medication…….. We are like the planets. We are never all in the same place at once. At times some of us are there and at others we are all spread out through the ether (Kendal!). Just waiting for the day we all align and everyone turns ip at once and hopefully we will have enough cups! Some great comments have been made about our current exhibition “Paint, Print, Photo, Ink….” so why not pop down to The Factory, Unit 31 to see it as it will only be up a couple of more weeks! Open during session times. Today the group explored using colouired pencils. We looked at using them in combination overlaying lines and then single lines to make up images. We also looked a little at blending colours using cross hatching and applying one over another to mix colours. This session fist of all s finishing off work from previous weeks on portraits. Then Anne-Mariefrom Lakeland Arts had the group sculpting wire portraits. The session then went on developing as we looked at the shadows we could create before we finally decided to attach them all together and fix it on the wall outside the unit. Rejoice in achieving your goal. A lot of different projects going on. Clare showed people how to make small jewellery pots or trays from paper mache’ round a small bowl using different coloured papers. Some were working on a sowing project. The C3 group were making plans for their window at the Comic Art Festival and Mat was designing for Space2Creates window. Today’s ward session was based on the art of Project Mayfly, by Katarina Prior, which has been exhibiting at the Rheged Centre. We used different-sized mayfly-shaped templates, and then decorated or themed them on our favourite experiences in life, or anything else life or mayfly-related! Using letraset, collage, pen, pencil and other embellishments, a variety of styles emerged, in a session which participants found to be both relaxing and enjoyable. WellArt today was very laid back with everyone focusing on their own projects. Sowing, painting and drawing all going on. I was so absorbed in the painting I was on with I completely forgot to take pictures and only realised when I sat down to post!